I love chili! Here's a winter recipe to warm you up as you gather around the table with others. 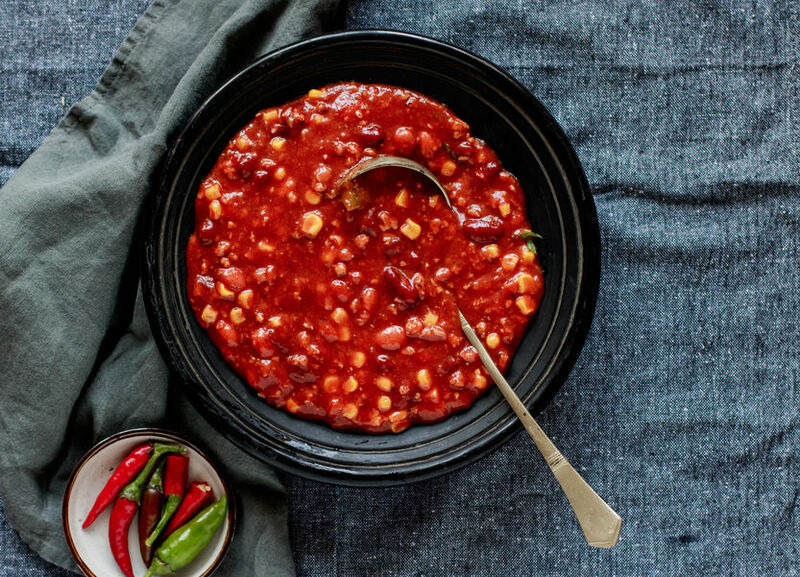 There are so many different Chili recipes. This is my version during the winter season. I’ve modified it slightly from my first recipe in my Cookbook ‘Short and Simple Recipes’. I like a chicken version during early spring or fall. Add more or less heat depending on your liking. 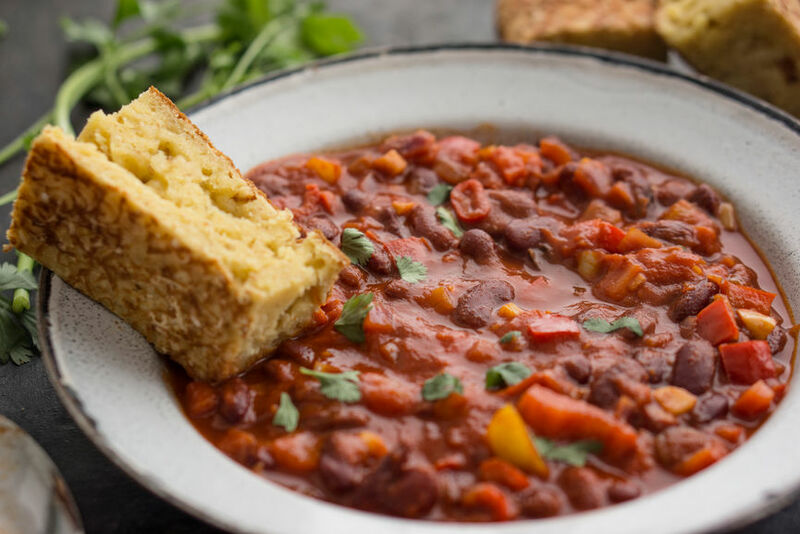 I typically do not prefer kidney beans but they fit in this recipe perfectly as well. I hope you enjoy this version and it keeps you warm during this chilly season. Heat a large dutch oven or heavy pot over medium heat and add about 2 Tbs of Olive Oil . Season beef round with salt and pepper and toss in bowl with the flour to coat. Add beef to dutch oven and cook til brown on all sides for about 3 minutes. If needed, cook half of the beef then the other half so not to over crowd the meat. Remove meat and place in a bowl. Season ground beef with salt and pepper and add meat to heated Dutch oven and cook til done. Remove and place in bowl with the beef round meat. Add 2 Tbs of Olive Oil to dutch oven and heat over medium heat and add onions, green pepper and carrots and sauté til just tender and the onions are translucent, about 3 – 5 minutes. Add garlic, jalapeno, oregano, cumin, chili powder, nutmeg, red pepper flakes and italian seasoning til all mixed together. Add cooked meat, the black beans, pinto beans and corn, can of diced tomatoes with juice and tomato sauce. Stir all ingredients til mixed together. Add beef stock (more or less depending on thickness of chili or preference) and incorporate into the chili. Add additional Salt and Pepper and seasonings to taste. If desired add lemon zest. Simmer Chili over heat for about 1 – 2 hours so all the flavors from the cooked vegetables, seasonings and meat in the Dutch oven are mingled and combined throughout the chili. Serve with your favorite garnishes and / or Cheddar Jalapeno Corn Bread. Gather around the table and Enjoy. Pre-heat oven to 350. Grease a 9 x 13 inch baking pan or dish. In another bowl, combine eggs, milk and butter. Then stir in the wet ingredients into the dry until all dry ingredients have been incorporated into the wet. Be sure not to over mix. Mix in 2 cups of the grated cheddar cheese, green onions and jalapeno and allow the mixture to rest for a few minutes. Pour batter into the prepared pan, smooth and even out the top and sprinkle the remaining cheddar cheese on top. Bake for about 30 – 35 minutes until a toothpick comes out clean. Remove from oven, cool and cut into squares. Serve warm with butter or soften cream cheese. The cornbread goes wonderfully well with chili or other hearty dish or for breakfast with a dollop of ricotta cheese, ham and arugula. Gather around the table and enjoy!